Inflection Point Systems is proud to announce its 26th place in the ranking of the Best Companies to Work For in Latin America in 2013, in the category of 50 to 500 employees. The Mayan Riviera hosted this great event organized by the Great Place to Work Institute that brought together some of the best companies to work for from Latin America. This is the second year that Inflection Point Systems participates in the Latin America ranking. Last year the company ranked in the 38th position, and this year it was an outstanding improvement to climb 12 positions to the 26th place in the ranking among the best companies to work for in Latin America. “We have been participating in this ranking for several years now. Inflection Point has consistently improved its ranking in the various categories year over year. 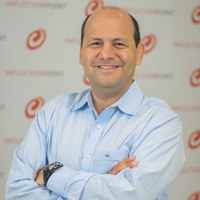 This continuous improvement make us very proud and reinforces our commitment with our employees to develop a great company culture to offer our clients leading edge services”, said Carlos Montemayor, CEO of Inflection Point Systems. Inflection Point also achieved 4th place in the ranking in Mexico (50 to 500 employees) and 1st place in the category of Respect for this year. Providing one of the best work environments for its employees is a competitive advantage that distinguishes Inflection Point Systems and shows in the exceptional service provided by its experts in custom software development, mobile app development, security solutions and content management systems to its clients.